•Don’t be afraid to mulch with logs and branches as the breakdown process is so rapid that fungus swallows everything quickly. •Permanent mulch cover should happen in gardens and around tree crops. Constant cycling must occur. •Chop and drop plants designed in. 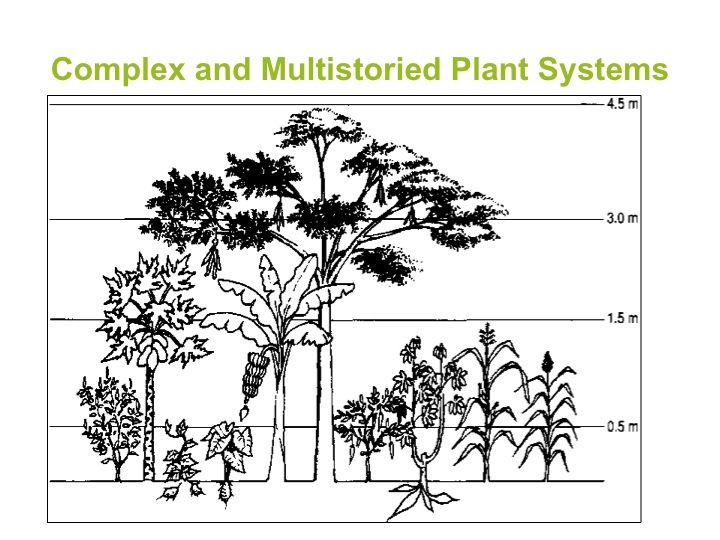 With its thin soils and eroding ways, Permaculture systems in the tropics should employ a complex and multi-storied plant system to maintain fertility. Monoculture’s prove to be disastrous and with the tropics abundant solar input it is easy to grow in layers. In fact common garden vegetables grow better in the shade of nitrogen-fixing trees or other vegetation or structures. 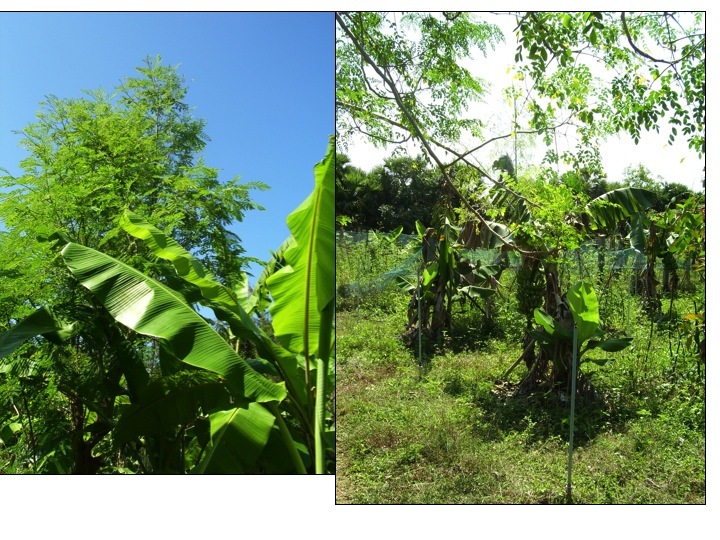 As you can see in the below picture a large nitrogen-fixing tree with its umbrella shape and thin leaves provides a dappled shade below to other crops such as (from left to right on the pic) Coffee, Papaya, Sweet Potato, Taro, Banana, Chili, Cassava, Corn, and Sorghum. 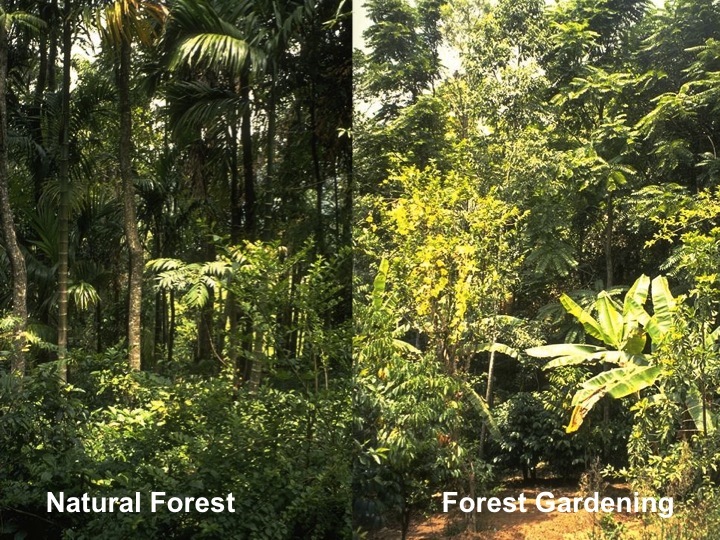 Tropical Permaculture is often defined by the ability of a site to mimic the forest and grow food in more of a layered, forest gardening approach. Using the shade and wind protection of larger species such as Moringa or Suriname Cherry, common garden vegetables such as a greens mix can be sown successfully in the colder, rainier months in the tropics. All the while the summer vegetables will thrive with shade at some point in the day. The below picture again shows the approach but this time in the drier tropics where palms emerge above the nitrogen fixers but with virtually the same system as above. This picture is then manifested into the picture below that I lifted off the internet at some point. It shows the mimicking style of Permaculture. Understand your forest type and then reconstruct it with fibers and fuels, food and medicine, fodder and fertility. 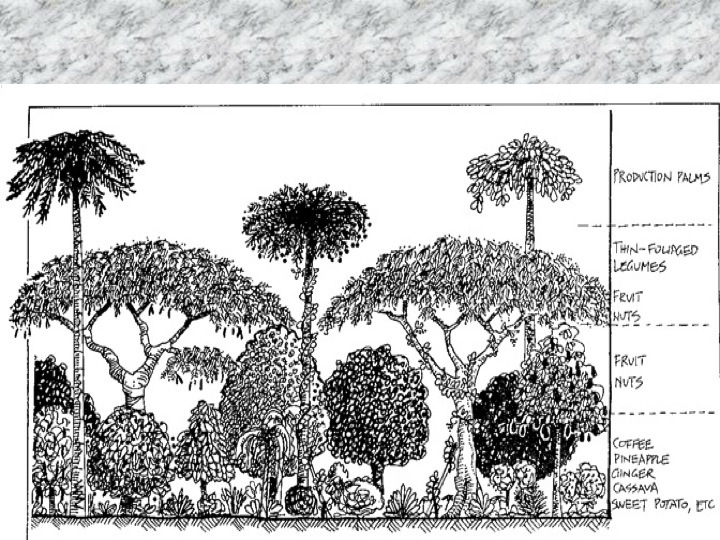 On the right below, in this dry tropical forest of Sri Lanka the forest is packed with all of these functions plus the ecosystem services of having a forest such as bird habitat and a more stable hydrological cycle. Furthermore, when you first are starting out on a site or converting pasture into vegetable gardens, you may have to erect structures to create this stair stepped approach. In Costa Rica we used plastic to create a spot for germination which is a common technique to keep the rain off of young vegetables. This increased germination rate and allowed us to transplant more successfully. 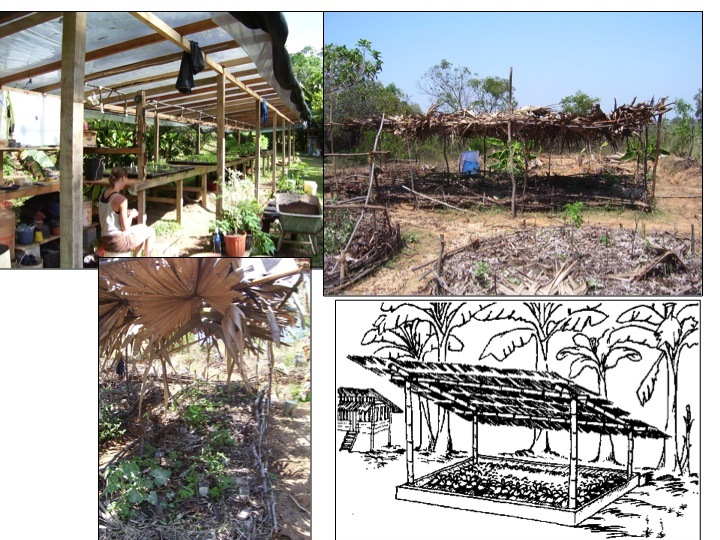 In India we used the waste leaves from roof thatching projects to build semi shade structures over the newly created vegetable beds. Their daily wilting despite heavy early morning watering and thick mulch led us to put posts in the ground and build a structure which held the palm leaves on top. Once this was in place the vegetables grew much more rapidly as their was no point in which photosynthesis ceased because of sun and temperature stress. In Malaysia I was fortunate to tour gardens of growers who were using Moringa and Luceana as plants that provide a bit more biodiversity to the banana patch. Without this the monoculture would have taken over yet these leguminous trees were fixing nitrogen and giving carbohydrates to the soil to feed the biology. They brought a simple layer to patch but their integration was key to maintaining fertility in this organic system. Another technique for building soil anywhere is mulching. However in the tropics with its rapid breakdown, logs and branches are used as mulch as well as cut grasses or herbs and other waste organic material. These higher concentrations of carbon are still consumed by fungus and insects but their breakdown is a bit slower. They can also be used on slopes to create terraces for quick, outer zone soil holding. 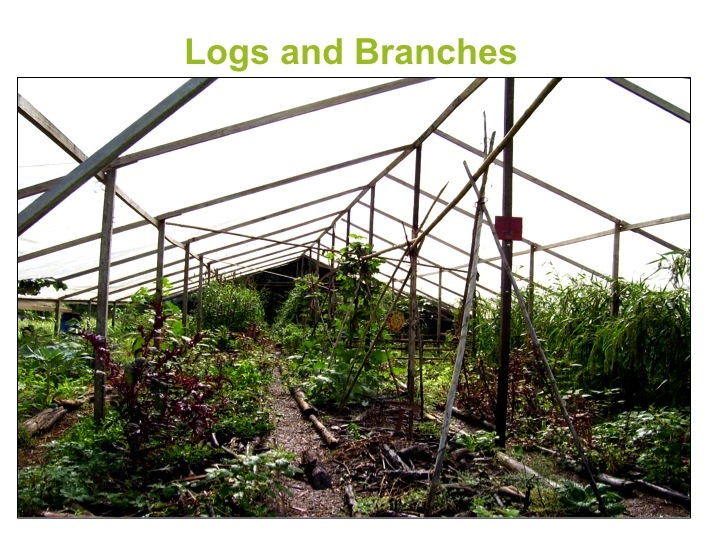 In the below picture in our greenhouse in Costa Rica we used logs as garden borders and we would find branches and make small piles of them around our bigger, more established plants. Alternatively we would make bigger piles and use it as cover crop essentially with the space not growing any food products but rather just an area for building soil for a short period before transplanting. 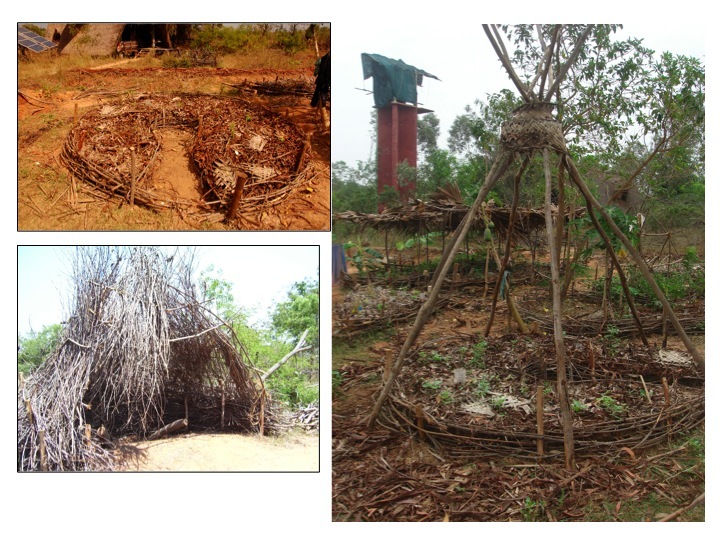 In India at Sadhana Forest in Tamil Nadu, we used logs and branches to create garden beds and thick mulches against the tremendous heat and drying winds. These were the waste product of disturbance as the project had successfully turned a desert into a forest after simply harvesting rainwater. Once the water was in the ground “invasive” (quite the repair job these hard-working immigrants were doing) Acacia’s had sprung up by the thousands covering the land with this pioneer, nitrogen-fixing species. Then a cyclone came through and ripped the shallow rooted trees out of the ground leaving behind a heap of complex, carbon material. We did burn some for cooking but fires were not built just to get rid of the material. Instead we shaped beds with the larger logs and branches, we mulched with the fallen leaves and small branches and even created garden art. 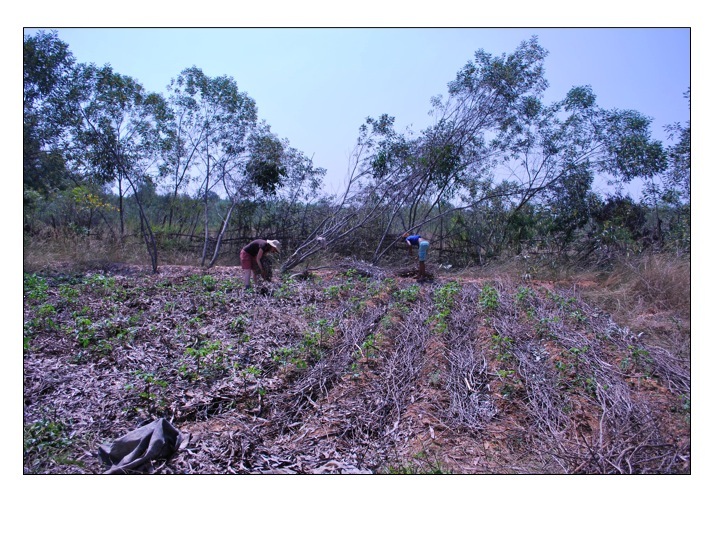 While there at Sadhana Forest in early 2009 giving a free PDC, myself and teaching partner Gautier Gras led a hands-on of using these materials for fertilizing the cassava patch. 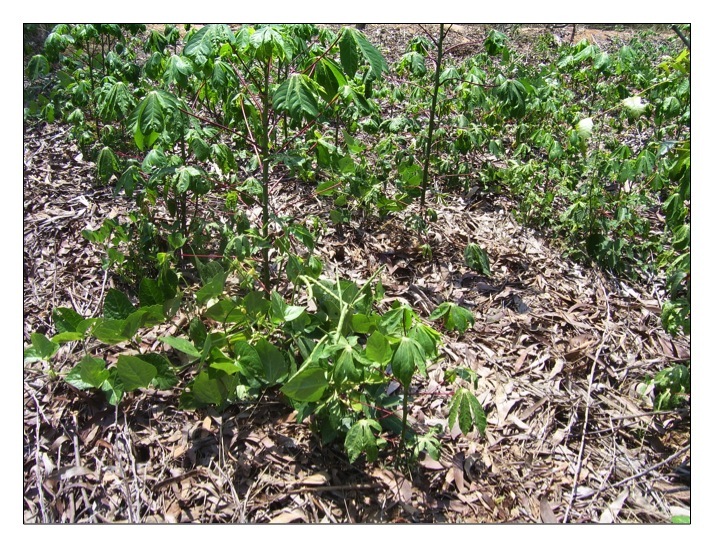 A normal ditch and mound system had been erected to grow this staple and was mulched initially. Because of the steep incline the mulch all fell to the pathways and the plants were left suffering in the hot, dry days. The plants were being attacked by pests and the organic garden managers remedy was a chili spray. While affective at first, it was merely a band-aid of a gaping hole known as withering soil fertility in the dry tropics. So with the 30 plus pairs of hands of our PDC, we mulched the pathways so that there was a level area to also mulch the beds. In the pic below on the right side you can see the aisles full of the Acacia branches while the left side reveals our ability to fully mulch the plants with small branches and leaves. After just one week myself and Gautier were cruising around the site and I encouraged him to stick his hand into the thick mulch of the beds and paths. To his surprise he pulled his hand out immediately and you could see the tiny beetles fall of his hand as he whipped his hand in unknown furry. The beetles are main decomposers in the dry tropics giving the organic material more edge for micro-organisms to further breakdown this material into the stable carbon compound known as humus. Within this week you could also see the plants starting to look more vibrant, to put off new growth and the damage from insects was waning. It was incredible to see just how quick the turnaround was but that is the humid tropics for you. Mulch is essential in the tropics and it must stick around for long enough to really cycle nutrients so use logs and branches freely. Remember the fertility of the tropics is held in the vegetation itself. Design in plants to produce those branches and logs in relative location so you can chop and drop and constantly cycle energy. Thank you for all the loads of info. Very useful. I’m from the Philippines and right now is involved in organic farming. If you could include in your mailing list, I’ll be more than grateful. More power to you and your advocacy. This is a wonderful source of information for thus learning or practicing permaculture in the humid tropics! I am starting my permaculture farm here in northwestern Cambodia. I will create my farm with neighbors and the staff of the NGO I work for here. We hope to incorporate permculture into our agricultural projects in the near future. I would love to get onto any discussion groups going on with others doing permaculture in the tropics, as I am just learning it now and would love to share my journey and take the teaching of others with more experience.